The top for Out of the Blue came about a few years ago as a desire to get my orphan block box closed. A few weeks ago I was asked if I had something I could quilt quickly for a 7-year-old girl and immediately thought of Out of the Blue. I finished the quilting on it and got it bound last week, but it still needed a label, threads trimmed, washing and the pillowcases for the girl’s siblings made. Now that all of that is done, I have a good picture of the quilt. Batting: The same batting I used in Dancing Flowers — I’m not sure what it is other than a black batting. This quilt is on my list for the 3rd Quarter Finish Along – but only because I gave in and listed EVERY UFO. I’m sending it to Aunt Marti for the UFO Parade. It’s also being sent in for the 2015 UFO Busting over at Field Trips in Fiber. It is of course part of the scope creep for my Crazy Challenge II which started August 15th. I love it, my colors! 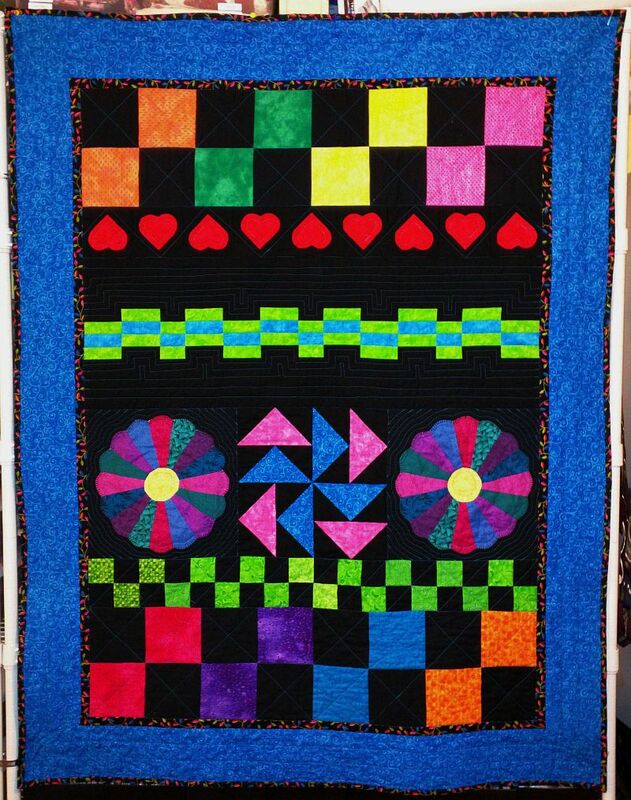 Such a bright fun quilt – I’m sure the recipient will love it.